The Lucy Variations by Sara Zarr. Little, Brown and Company, 2013. Currently available. Face Value: Sara Zarr has some of the better YA covers on the shelf. This cover is mature enough to appeal to readers who are turned off by the pink and purple overload that plagues most YA romantic fiction. There’s something beautiful about the black and white contrast of piano keys. I love them in this cover design. Does it break the slate? This story is about change and growth. Lucy grows into a young woman who can make her own decisions. Her growth into slatebreaking territory is a rough journey. Lucy experiences pain, and causes pain for others, before she figures out what feels good and right for her future. Who would we give it to? Girls who are under pressure from helicopter parents and facing high expectations at home and school will appreciate Lucy’s journey toward self-determination. Review: I am fortunate in that I was blessed with a mostly balanced childhood. Obviously there were experiences that I wish would have been different, but the expectations my parents set for me were not unreasonable. Reading The Lucy Variations made me feel grateful for the calm moments of my childhood. Zarr’s latest novel tells the story of Lucy Beck-Moreau, a brilliant pianist whose career was skyrocketing…and then came to an abrupt halt. Although Lucy still loves music, she cannot abide the pressure of the competitions and performances. She decides to walk out on a major competition in Prague, shocking her family, her teacher, and the entire professional music world. We enter Lucy’s story almost a year after her sudden exit from the professional world. She hasn’t touched a piano since the day she walked off stage in Prague. Although her day-to-day life has a much more relaxed pace, the tension at home is thick. Her grandfather, the chief engineer of her music career, is still furious that Lucy quit. He is instead investing all of his time and energy in Gus, Lucy’s talented younger brother. Lucy is gradually adjusting to the role of supportive older sister, but part of her misses the music. She hates to admit it, but she also misses some of the attention that comes with performing. Lucy’s parents and grandfather hire a new piano teacher for Gus to better facilitate his growth as an artist. The teacher’s name is Will, and he is a former child star, just like Lucy. Although Will is there to teach Gus, Lucy finds herself drawn to him. He has an appealing approach to training and performing that Lucy finds refreshing. With Will’s encouragement, Lucy gradually rekindles her relationship with music. Lucy and Will become friends, and then something more. It’s not exactly a romantic relationship, but Lucy pines for Will – even though he is much older and married. They share an intimacy that begins with music and grows into emotional intimacy. The relationship never crosses into sketchy territory, but there are moments of physical closeness that made me feel icky while reading. Will’s wife Aruna catches on, too. Aruna develops a suspicion of this unusual teacher-student relationship and Lucy fears that she will lose her friendship with Will. As a reader and reviewer, the relationship between Lucy and Will was a struggle for me to comprehend. Everything in their relationship was consensual, and Lucy pursued the opportunities for them to be together. Yet Will was taking advantage of her for her fame. He was also much older and in a committed relationship. So, given this nontraditional relationship, can this book still be Slatebreaking? I feel that it is, because Lucy learns to be a stronger friend, daughter, and sister based on the mistakes she makes with Will. Her choices have awkward outcomes and she knows she can make better decisions in the future. Ultimately, the relationship with Will leads Lucy to take control of her life. She becomes more assertive and more proactive. Still, I can’t help but feel the creepiness of the older man/younger woman relationship lingering with me long after I have finished the book. For those of you who have read the book, what do you think? How did the relationship strike you? Despite my struggle to understand the relationship Zarr has created between Lucy and Will, I did enjoy the book. The writing is outstanding, as are the characters that surround Lucy. As a protagonist, Lucy is fascinating to read. She has maturity beyond her age because she has had so much experience as a child star. That’s a factor that leads to her crushes on older men, including her teachers. Yet Lucy lags in development in other areas, such as socio-emotional awareness and interpersonal communication. She has been pushed so hard to grow up quickly, and she was pulled away from the social and institutional experiences that most people her age have in common. These missed opportunities create gaps in Lucy’s childhood that make it difficult for her to go through some of the developmental processes that other teens handle easily. The complexity of the character is refreshing. 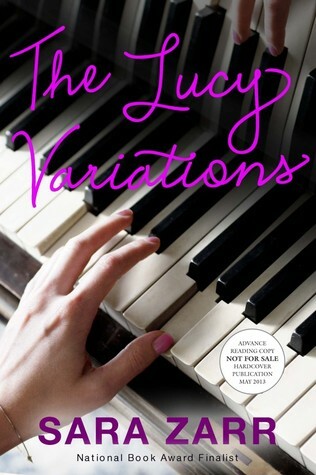 The Lucy Variations is not the kind of light, romantic fare that I associate with summer reading, but it is definitely worth some of your summer reading time. It is a provocative examination of growing up and growing into oneself. This entry was posted in Reviews, Young Adult and tagged Music, piano, students, teachers. Bookmark the permalink.